Karen Brown, left, Jim Ferree, Ian Engle and Micheal Bertram were among about 10 people participating Thursday in a walkabout to gauge outdoor accessibility and safety in Craig. 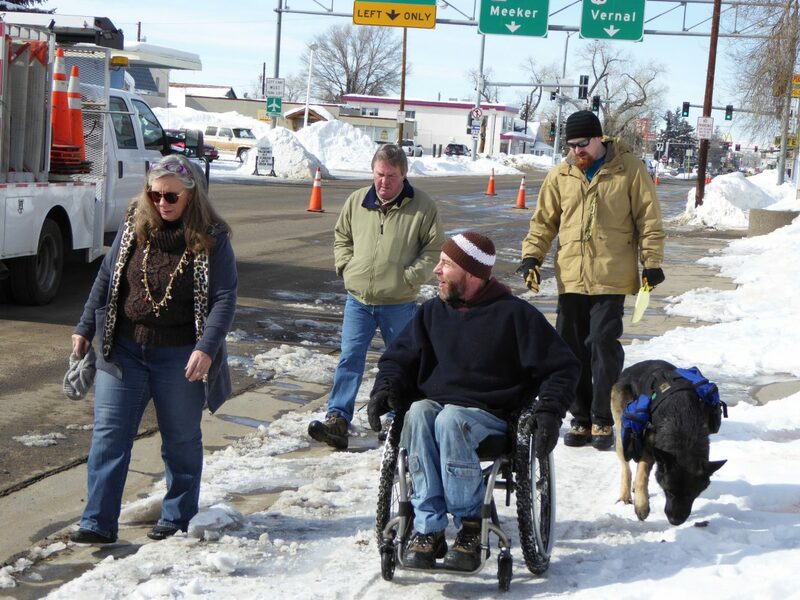 Craig — A cluster of concerned community members traveled through the downtown area of Craig and then west toward Walgreens on Thursday morning, on a quest to discover just how difficult it is for someone with mobility challenges to move about town. In spots the going was tough, and the group hopes to harness local support — and possibly grant money — to make improvements. Improving sidewalks on Victory Way and forging a clear route from downtown to nearby restaurants and businesses surfaced as two preliminary goals. One of the people in the group using a wheelchair, Ian Engle, noted spots that were particularly challenging. Engle is the executive director of the Northwest Colorado Center for Independence, an organization that serves Routt, Moffat, Summit, Rio Blanco and Grand counties. He’d come from Steamboat Springs to participate in the walkabout. Ferree agreed, noting that it’s a safety issue for people whether they have mobility challenges or not. The residents on Thursday’s walkabout, as they termed it, included members of the local grassroots group Freedom from Isolation, started about a year ago when Craig resident Kathy Carlton and others decided to come together to improve conditions for people who need help with mobility. That group led another tour a few months ago that included visits to local businesses. Members of Freedom from Isolation talked with staff members and awarded stickers that said “Disability Friendly” if the businesses had taken basic steps toward accessibility — and if staff members were engaged in the accessibility process. Thursday’s event focused on outdoor accessibility. “What we’re doing is trying to get the Yampa downtown area and the area over by McDonald’s linked for pedestrians,” said Micheal Bertram, direct service supervisor for the Northwest Colorado Center for Independence. Bertram’s office is in Craig. Another walkabout participant was Jean Hahn, a community integration specialist with Horizons Specialized Services in Craig. Hahn noted the need for better accessibility to restaurant bathrooms and other spaces, and she said she’d like to see people cultivate a bit more patience when someone with a disability needs some extra time to accomplish a task. She said she was moved by Thursday’s walkabout. “Since I am a little bit disabled myself, these guys inspire me to make this community better,” she said. Ferree said the city has been successful in securing grant money to make outdoor improvements in the past. He said the city received about $300,000 from the Colorado Department of Local Affairs — matched locally with $400,000 — in 1996 and 1997 to repair sidewalks, erect street lights and make other improvements on the 400 and 500 blocks of Yampa Avenue. Ferree stressed the importance of demonstrating widespread community support when applying for such grants. “When you apply for these grants with the (Colorado) Department of Local Affairs, the city will probably be the applicant because they like to deal with public entities,” Ferree said. But, he noted that if community organizations such as the Craig Downtown Business Association and the Northwest Colorado Center for Independent Living attach letters of support, then the grant application is more likely to succeed. Ferree said he’s seen signs of local support, based on community surveys, for projects that improve accessibility. Thursday’s walkabout included stretches of navigable sidewalk for people using wheelchairs, but it also turned up impenetrable snow barriers, steep drop-offs and narrow openings bookended by snow banks and other obstacles. Craig resident Bobby Holmberg, who uses a wheelchair, demonstrated his route to Walgreens, where he works. Holmberg traveled on Sixth Street — snow and ice made sidewalks unusable for wheelchairs — staying as close to the curb as he could. He said that he uses the street even in the summer to avoid the bumps on the sidewalks, and he noted that it can be hard to turn his head to see cars. Engle noted the advantage of traveling on the left side of a two-way road when using a wheelchair — advice confirmed by Colorado Revised Statutes, Title 42-4-805, and found at http://lpdirect.net/casb/crs/42-4-805.html. Ferree mentioned, in addition to applying for grants for sidewalk improvements, the possibility of approaching City Council this summer. “We’ll develop priorities together — Ian (Engle) and Mike (Bertram) and I will — and we’ll go to City Council and see what we might be able to afford this summer,” Ferree said. Karen Brown, one of the people who went on Thursday’s walkabout, voiced optimism about a presentation to the City Council. “They’re really willing to work with us,” she said. Brown, president of the Craig Downtown Business Association, said she understands the importance of businesses working together to maintain clear sidewalks and good access to the their entryways. Brown also manages the Community Budget Center, where Thursday’s walkabout began. Engle and Bertram said another walkabout was in the works for the spring, and they said they intended to revisit local businesses. Engle noted the importance of working with businesses to develop reasonable plans with clear steps — and to provide information on possible tax incentives.